We started by taking their existing design and created a solid foundation with a custom Ruby on Rails application to replace their failing PHP web site. Once the foundation was in place we began to slowly redesign key elements of the site, such as the navigation, coupons, search functions and administration. Private Branding – Each business gets a private branded partner website just for their customers. Personal Vendors – We all have our favorite places to shop, eat or find help. 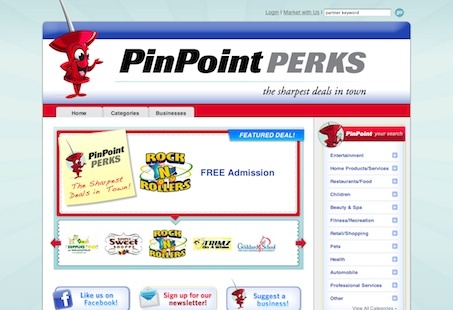 PinPoint Perks allows businesses to add their favorites, sending a personal recommendation to their clients. No Competition – Business can block all of the competitors in their category, or individual ones they don’t like. Free Marketing – PinPoint Perks sends thousands of personal branded emails to customers each month on behalf of their partners. Not to mention their are some great deals on the site, most of which are exclusive to PinPoint Perks. After two years in business, it was time for PinPoint Perks to take the next step. Just this past month we spent some time on the organization of the site, added some key pieces for search engine optimization, and took the covers off the site, opening it to the general public. The reception has been great.